Thanks for popping in to visit with me. Grab a cuppa while you look around .... We are now in Maryborough, Qld, Australia My blog was est 5Feb, 2010. I hope you enjoy your visit. We decided to go for a bit of a drive on Saturday and headed up to Bundaberg about an hour from here. All around this area and north its a Sugar Cane District - these smaller guage train tracks are seen all over the place as the smaller cane trains are used for bringing in the cane harvest to the mills. No matter if its a crop of Canola, Wheat,(like we had around us down south) or Sugar Cane ....... There is just something about seeing acres of cropping that brings a joy to my heart (something I don't seem to get seeing acres of housing sprawled out). .
where the sandy beach is! Its a protected area and the sand dunes are not to be walked on. It must be an amazing sight to see of an evening! How lovely is this beach! I really love this fabric. It's a heavier cotton that I had originally purchased to make myself a skirt with ....... but that hasn't happened and I needed new chair pads since the old ones were literally falling apart! I only have a limited bit of this material and hope to use a bit more of it on the veranda, so decided to use this other material for the other side. I'm rather pleased with how they turned out! week has passed ........ things you thought you might have gotten done, remain undone ....... like some penfriend letters I've been going to sit and write the past few weeks since getting back from Christmas in Townsville! On the other side of things, the excitement of a new year usually sets things off in other directions and crafting projects get underway once again. 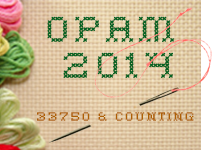 OPAM has commenced and I managed a total of 7 items this month (5 dishcloths and 2 kitchen towels)..... its a start! This weekend we headed down to Brisbane to celebrate my Dad turning 90!!! He actually has an older Brother who is 92 (who couldn't make it) and 2 of his sisters still living! We had a great time catching up with cousins and my Sister Kathy and her hubbie Jim managed to fly over from New Zealand for the weekend. As you might be able to tell, I think the highlight for Dad was the cake and being centre of attention for quite a big photo shoot as we had lots of different members having their photo taken with him! After searching for an hour and knocking my tin of buttons all over the sewing room floor, Walking down to work in the garden (which seemed better than picking up the buttons at that time ) ........ I came back up and found them!! YAH!!! So I sat and worked a bit of stitching on the Woodland Runner! I'm also hoping to work my way through some of my stash....es........ yep, that would be plural! You see I have a material stash ........ and then I have a yarn stash ........ and then there is quite the stash of other various crafting bits and bobs....... and it would seem a Stash of UFO's!!! Look Closely to the right behind the trees ..... see the Camels! I saw these as we were driving down the highway!! car, think about how I could incorporate some of those into crochet plans for items I hope to make during the year ....and hopefully share here with you all. So while I spent the morning doing a few chores, gardening and working on my embroidery project ..... Pete had gone to Lentil Dam again to do some fishing. I knew he would be gone for a few hours which is why I decided to take advantage and have some time at home all alone to play lol He caught his first Barramundi!!! And even better ........ he brought it home! I have a lovely lot of fish fillets all cut up which will do a few meals!!! Yum! Nothing better than fresh caught fish - and it certainly helps lower the grocery bill this week! Well it's almost time for me to go and cook dinner so I'll finish here as I want to do a bit more work on a Christmas UFO I found today ...... I'll be sharing that tomorrow I hope! and the older ones will become part of the rag bag until thread bare when they will visit the compost heap (which they can being cotton)! This weekend during our FNSI ....... or extension thereof lol, I also got to work on a couple of kitchen towels for the daughter. I made a couple for her and her partner when they first moved into their little flat in Melbourne 4yrs ago ....... as they have worn out, I've been requested to make another, and now it seems all the originals have finally been worn out. "Down the Rabbit Hole" quilt for example!). 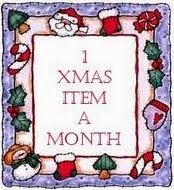 Signups for this will be happening over on her blog around the end of January, so keep an eye out for it! 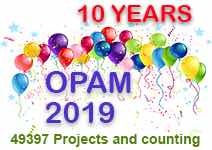 I looked at my OPAM page tab (top of my blog) - Ive been keeping a page for my OPAM since 2014 and find it nice to be able to actually remember and see all the projects I completed each year ... but my first year was 2012! I missed the signups in 2013 and have tried not to miss them since! The top of my 2018 OPAM shows the projects I was working on when the year started that I had hoped to get completed ....... I only see a couple of those crossed out, so it looks like the others are still on my UFO list! 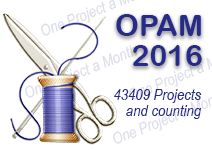 Naturally I did finish a number of other projects during the year, but I would really like to get more of these crossed off this year if I can ........ well, I c..a..n....... but ......hmmmm, I guess we shall see won't we! Maybe I need to give them all numbers (as well as other unfinished projects ) and get them done that way???? But I see Kris is talking about another new Badge for 2019! You might remember a couple of these projects from me working on them last year......... I wonder which one will get finished first? Do you think I should number them?? Which one do you think I should finish first???? I'll leave you with that thought .....I'm off to work...... See Ya! 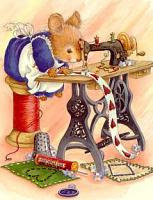 What crafts or creative domestic activities did you pursue when you were young?..... And ......Have you continued with them? My Grandmother had a huge impression on me not just growing up, but also once I'd had our own children. When I was around the age of 10 she taught me how to crochet. It's something I still do today as many of you know. leads to lots of creativity! Sewing curtains, bed covers and such became the "norm" (although I do need to get a new quilt cover finished for our bed which is a bit larger now than the old one we had) Even as a child growing up we had very little - I remember needing shelves as a teenager for my bedroom to put my books and School Study stuff in ..... I ended up with 2 cardboard boxes that I glued together and covered with pretty Contact Paper - they did a great job for almost 2 years! If I can make something for our home, then I usually do rather than spending money on buying the item! In the Kitchen you will find my aprons, dishcloths, pot mits, Trivets (ahem .....after taking a photo of my much used dishcloths, it would seem it's time to make a new batch!) 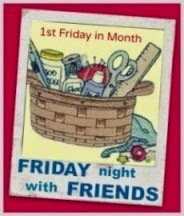 FNSI hosted by Wendy last night (although the weekend is always utilized), may see me doing some of these later today! you just need something light to throw over you. I do make lots of things for gifts and these vary depending on the type of craft ....... and as many of you know, I learnt to knit a few years back and have been able to knit items of clothing which has been amazing! My love of Gardening also came about through need. God showed me how I could utilize so many things around me in order to make a garden ...... both for enjoyment and for use! guest room is busy, but with my bookshelves in here its now become much more relaxing to look at from the veranda area and is used far more (at least by me lol), as a wonderful nook to lay back and read a book or magazine! ........ and now I can show you those lovely pillowcases my friend Lyn made me for Christmas! They are just perfect for in here and I love them ....... Thanks again Lyn! We were lucky to be able to catch up with a few friends while we were in Townsville ..... our old neighbours Ros (short for Roslyn) and Wayne (but I forget to grab a photo of us all. We really enjoyed catching up with them and Ros showed Pete some of her orchids ...... which then led to us visiting an orchid nursery to get some for Pete as his Christmas Gift. These are the photos of what they will look like when they do flower .... for now we have little bitty ones to look after . started back in 2013 when we did a 12WBT program. Over the years many from our Aussie Wide group have been able to meet up in various places. After the initial 12wbt program we made the decision to keep the group closed and it's worked really well in making some wonderful friendships! I was also lucky to be able to meet up with Jenny who is know to a number of embroiders in the Blogging world from her blog Elefantz . If you don't know about her wonderful designs you should definitely stop by her blog and new Etsy shop to take a look. We had a fun time together exploring the garden as well as the sewing room while the husbands talked plumbing and "boy stuff" lol. We left Townsville on Boxing Day and did the 12hr drive in one hit. Usually I'm busy crocheting during long drives ...... but this time I found myself busy taking photos of all sorts of things as we drove along ........lots of crochet designs swimming along in my head ...... hopefully I get some time this year to put them into reality. Some of the scenery is just amazing! The weekend just gone we had to drive down to see Dad in Brisbane ....... it was nice to be back in my old stomping grounds of Wynnum. After the big drive to Townsville in my little car, we realized we needed to upgrade Petes old ute to a newer model and with a dual cab so it could be used for longer trips giving us the advantage of being able to "walk" on arrival rather than both having sore lower backs like we did after the 12hr stint! So after work on Thursday we picked up the new ute before heading down to Wynnum were we stayed a couple of nights. After an early morning run/walk along the foreshore, Pete and I found a little place to go and enjoy a relaxing breakfast before heading around to see Dad. couple of friends for dinner Friday night and then my old friend Kaye came for a 6am walk along the foreshore with me before we left to make the 3-4hr drive back home again. Kaye and I became friends when our daughter became besties at kindergarden! Over the years we have managed to catch up in lots of places both in Vic and Qld! And speaking of wonderful friendships ......... I was really blessed when we arrived back from Townsville and had a parcel turn up from Lyn with a pair of beautiful handmade pillow cases! I love them Lyn and look forward to showing them off in my next post! I have just the spot for them. Time for me to finish here this evening. This young man shold be commended! Locusts or grasshoppers..... but who can find the grass?